Rough set theory, proposed by Pawlak in the early 1980s, is an extension of the classical set theory for modeling uncertainty or imprecision information. In this paper, we investigate partial relations and propose the concept of knowledge granulation based on the maximal consistent block in interval-valued information systems. The knowledge granulation can provide important approaches to measuring the discernibility of different knowledge in interval-valued information systems. 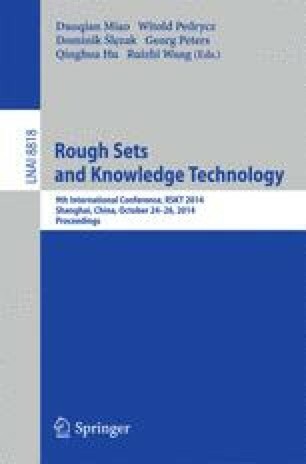 These results in this paper may be helpful for understanding the essence of rough approximation and attribute reduction in interval-valued information systems.